IoT application development: How to build a successful IoT project? Understanding the Internet of Things potential, companies invest in this technology to automate workflow, optimize business processes, manage data, and improve life quality. 60% of surveyed companies noted that IoT projects and initiatives often seem to be not complicated on paper, but prove to be much more complex in the implementation. 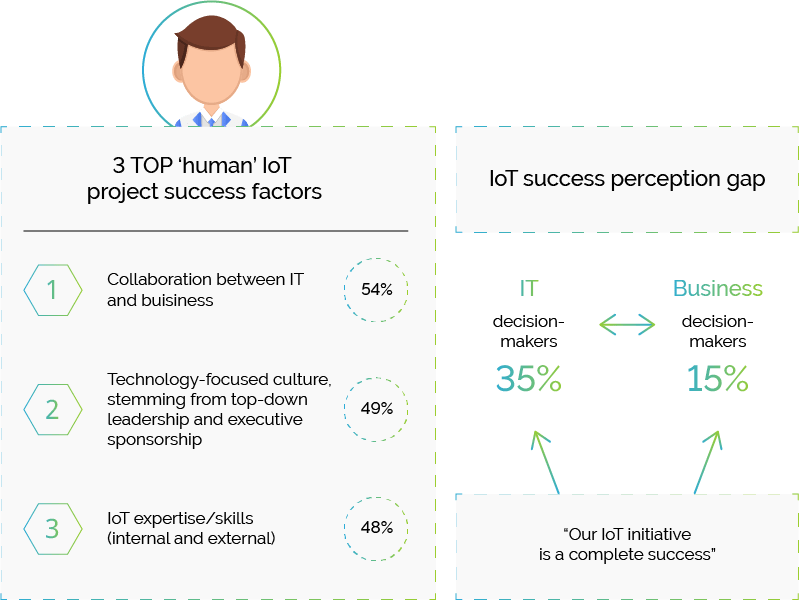 Though 35% of IT companies considered their IoT initiatives as being successful, only 15% of business executives think the same way. A third of all completed IoT projects are not considered by companies as being successful. So, in this post, we’ll consider the main factors for successful IoT application development as well as provide useful advice of how to build a great IoT solution that will solve your tasks and operational challenges. While developing a software project, many companies fail to perform a marketing research, and IoT projects are not the exception. This step directly affects the final result: if you haven’t studied the market, you are unlikely to achieve success. Even if your idea is great, building an IoT solution customers don’t need, will lead to IoT project failure. According to IoT surveys, the lack of a market necessity for your product is the main reason for it (42%). So, before starting IoT application development, define a product concept. A project idea and goals your business needs to meet are the core of your future IoT solution. Determine your target audience, find out their problems. Then, make a competitor analysis: find the main rivals, those who dominate the market in the niche you’re going to occupy and see how they solve user problems. Also, study competitors’ products including the functionality, peculiarities, strong and weak sides. By making these important things you’ll understand what features you should implement so that your solution will stand out from the others. Once this stage is performed, you can get down to preparing the SRS (software requirements specification). Learn how to create a spec right. IoT application development needs having high expertise: you are unlikely to achieve success if you give your project to IT beginners. The Internet of Things is a complicated area requiring the experienced specialists including business analysts, senior software developers, and quality assurance engineers (QA). Speaking about IoT project development, tools and technologies you choose, play an important role. Certainly, the innovativeness is the king, but in this case, it doesn’t always have a major significance. Also, don’t chase the most expensive tools. For example, the first generation of smart parking worked on street sensors. While their establishment costs a lot, they could be easily damaged by cars, weather and other factors. Certainly, the impact on investment in this IoT solution was poor. However, with time this technology was replaced by more cheap and reliable video sensors, which facilitated the popularity of smart parking projects. Though IoT has great potential for different life spheres and business industries and attracts huge investment, there remains a security issue, the main problem of the Internet of Things. Today everything, from smart cars to smart electric grids, can be hacked and the consequences may be terrible. So, for now providing high-security level is the key requirement during IoT project development. There are many security risks you should know and manage. Learn what are they and how to avoid, from the previous post. Minimizing vulnerabilities is essential for the project success, so focus on proven technologies, ensure data protection, and choose a reliable company for IoT application development. Don’t hurry to build a large complex IoT project. In most cases, it’s better to start with a small or middle-sized IoT solution. The risks will be lower as well as the expenses. While developing a complicated product there is the risk of losing a lot of money if it fails. Once you gain experience and market understanding, you’ll be able to scale it or to get down to more ambitious projects. Ensure the collaboration between IT, business analysts and marketing specialists. Long before IoT project development beginning study the market, competitors and validate your product idea. 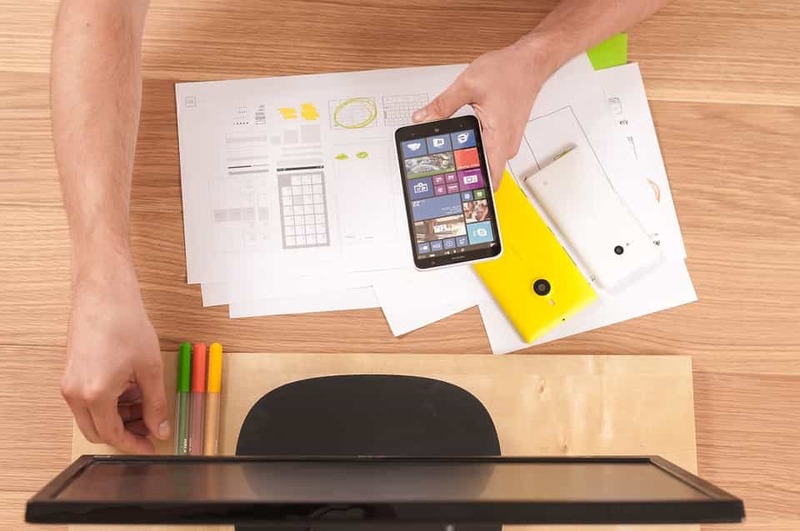 Decide what features you should implement to stand out from rivals and gain success. Take care of IoT security from the very project beginning. Choose proven tools and technologies and apply to a reliable software development company. Also, replace existing outdated systems with architectures that operate on open standards. Take into account the issue of devices’ compatibility while building an IoT solution. Thus, IoT application development requires a thoughtful approach and involve many success factors. By taking them into account you will highly improve your chances to build an effective IoT project that will allow you to achieve your business specific objectives.